View a slideshow from Fable Soap Co.
After they killed the pigs and removed the meat for cooking, finally all that remained unused was a vat of animal fat. Jeriel Sydney and her husband, Tim Veatch, were working their way through different farms in Italy, soaking up all the knowledge each one had to offer. The last on their route practiced the mantra of waste not. 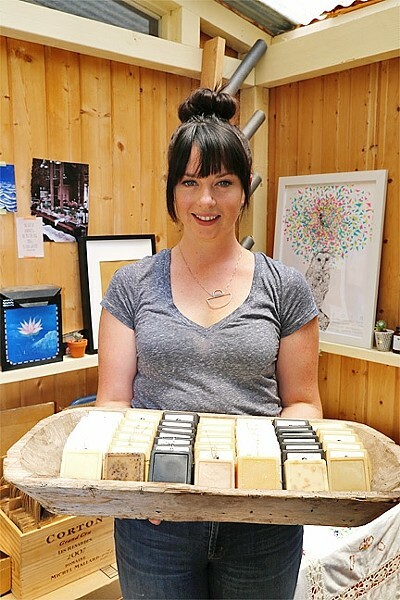 MISS CLEAN: Jeriel Sydney, of Morro Bay, started making goat milk soap while living in Oakland several years ago. She now sells it under the label Fable Soap Co.
"They were all, 'OK, so we'll make soap now,'" Sydney said. 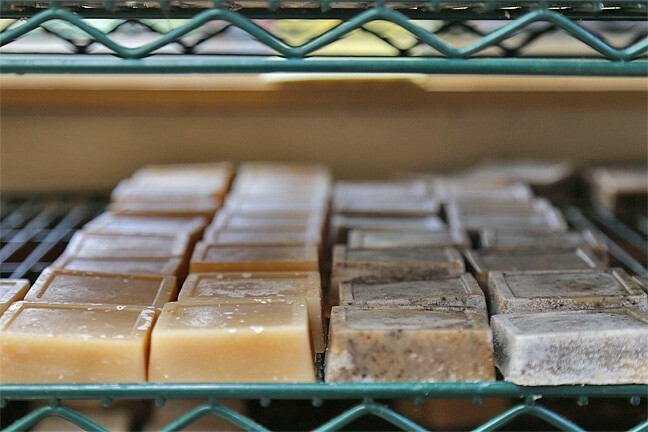 "When you're making animal-fat soap it takes forever, but it was really fun. We were drinking wine and eating. We started using the soap. My husband's always had really sensitive skin and his skin totally cleared up." That pig fat was a huge turning point in Sydney's life. The couple had gone to Italy so Veatch could perfect his craft as a chef, but it spurred his wife to start cooking up bath products when they returned home to Oakland. In 2014, her company, Fable Soap Co. (which would grow to carry beard balm, mustache wax, soy candles, bath soaks, and more), was born. "It was this idea of making everything that you use, so for me it was just one more thing that I could make and use for myself, Sydney said. "And then the idea that it could actually have a benefit for people's skin and help them was exciting." Sydney fell in love with making soap from goat milk because of how moisturizing it was and how different skin types all responded positively to using it. She and her husband had met on the Central Coast and knew they wanted to come back some day, so when Veatch was offered the position of executive chef at Thomas Hill Organics in Paso Robles, the couple packed up and settled down in Morro Bay in November. In the back of their home is Sydney's sun-soaked soap lab wafting with the smells of frankincense, grapefruit, and coffee. Rows of different colored soaps are stacked on several shelves, and even more shelves are groaning under the weight of soy candles and bath soaks. ALL STOCKED UP: Fable Soap Co.’s bars are made from goat milk from Tomales Farmstead Creamery in Petaluma, Calif., and scented with natural essential oils. Every few weeks Sydney gets a batch of goat milk from Tomales Farmstead Creamery in Peteluma, Calif. She partially freezes the milk, and then adds lye, which leads to a quick chemical reaction. Then essential oils are added for scent, and that mixture is blended. The soap is poured into a mold and sits overnight in the freezer. The whole process takes about two weeks. Sydney has a soft spot for the Bee and Jupiter soap bar, which uses myrrh and manuka honey. The myrrh has uplifting restorative qualities, and manuka honey is known for its antimicrobial benefits. It has a warm, comforting smell. "It smells really balsamic-y and beautiful," Sydney said. "That was one of the first scented soaps that I really started to play with." She hands me a bar of the salted grapefruit soap to sniff. It glistens with bright chunks of salt from a mine in Slovenia owned by a young couple. The tart wisps of grapefruit and the bitterness of the salt blend together to smell like summer. SCRUB A DUB DUB : Fable Soap Co.’s soaps, beard balm, mustache wax, candles, bath soaks, and more are sold locally at Len Collective in SLO and the General Store in Paso Robles, as well as online at etsy.com. Before Sydney took to her lab to create soothing body care potions, she worked for a nonprofit focused on helping women that were victims of domestic abuse and sexual assault. After she left that world, Sydney still wanted to help women in crisis, so for every bar of Fable soap that's purchased another is donated to a women's shelter. Bars of goat milk soap have made their way to hands in women's shelters in Oakland, San Luis Obispo, and across the country. A bar of fancy soap might seem like a small, even silly thing to gift someone whose world has collapsed, but Sydney knows the power of washing away your troubles. "I just saw the ways that those little luxuries really made a difference in women's lives," she said. "I know it's something I take for granted. I wanted to find a way to give back, and I wanted to work with women." Ryah Cooley is so fresh, so clean at rcooley@newtimesslo.com.